So let's walk through what's going on here. 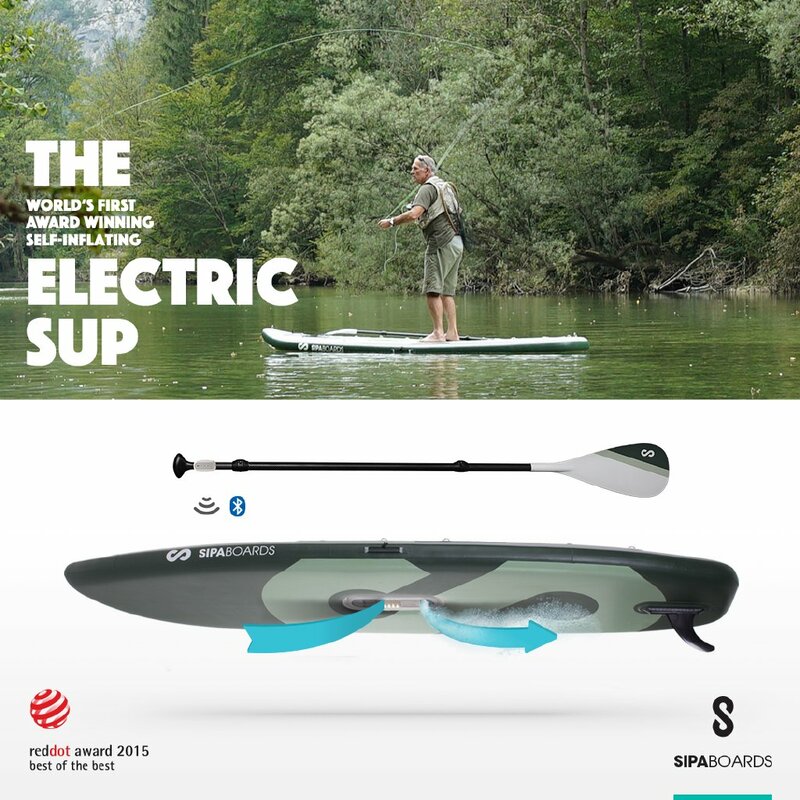 It's an inflatable stand up paddleboard with a nice, large platform (almost 6 feet long by 3 feet wide) to paddle and fish from. Like most fishing-oriented SUPs, the Fisherman has a lot of D rings to tie and strap things down, be it fishing gear, dry bags, coolers, whatever. But that's where the "normal" comparables end. At the core of this SUP is a "jet engine," basically a centrally located compressor that serves two functions. The first is that it inflates your board in a few short minutes (video below). The second is that it also plays the role of trolling motor, providing extra "paddle assist" that keeps you on the move for up to 3 hours. Oh, and how do you control this electric jet engine? Through a Bluetooth control in your paddle, of course. How slick is that? SipaBoards delivers all the advantages of inflatables, like easy storage and transport, at the same time boldly breaking new ground with self-inflation and several hours of paddle assist from the fully integrated electric motor. Now I'm not going to lie, all these bells and whistles don't come inexpensively, but damn if this board wouldn't be a ton of fun to take out on the water. Really hope some demos show up at some point here in the US. MSRP is $2790, but the SipaBoard Fisherman is currently being offered at an introductory-sale price of $1990. That's a really interesting product! I wonder what the battery life is for the motor and remote. If it's anything like my GoPro with the bluetooth on, then it can't be good. Yeah, it most probably is gonna be a hit this year. It really is expensive, but it seems worth it. I can't wait to see one up close!